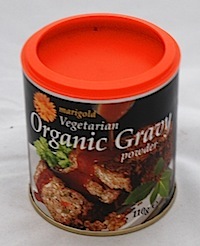 An organic vegetarian gravy powder from Marigold. I use Marigold Veg Stock all the time, I think it is one of the best out there. The gravy is quite simple to make with boiling water and stirring, but it does thicken extremely quick so keep an eye on it. I have to admit when I first saw it I though uurrgggh, the colour is a bit off putting, a bit orangey in tone. However it does have a good flavour and is a very nice gravy. I think they need to add something to make it a bit more brown in colour. 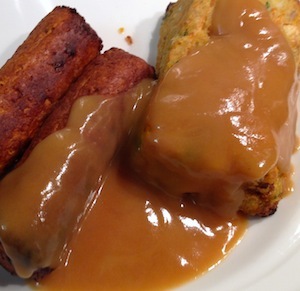 Perfect for Sunday Lunch or ideal on sausage & chips. Each 110gram pack is suitable for vegetarians and vegan as far as I can tell (see faq). Organic. Per 22gram serving is 79kcal. I paid £1.99 in an independent health food shop.